I didnt realize until last night that yesterday was World Suicide Awareness Day, and then today is 9.11 so I figured today was a fitting day as ever to wear my Always Keep Fighting Shirt. You may remember from my previous post on #AKF that this is a subject that I feel very close too. I also feel like it fits America, not to sound too political but Americans we fight. Right, wrong, good, bad we keep fighting. I know a few former and active military and I know it takes it toll. Thank you for your service! For those struggling with depression, know there is someone out there that loves you. If thats not enough, there is so much the world has to offer go out and see it!! There is beauty everywhere go and find it. Want a travel buddy, you know where to find me. A way my family shares love is through pizza. Before I was born my mom and dad owned a small New-York Style pizza place. It unfortunately didnt work out but ever since pizza has been in the blood. Joe and I didnt really start honing our pizza making skills until we went to Via Napoli in Epcot and had some amazing life changing pizza. I wanted to recreate it and thus started our journey. 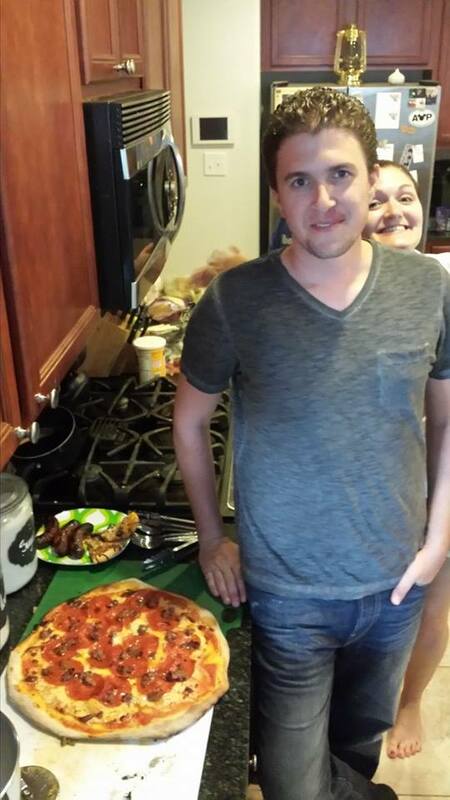 Our early attempts at pizza were good but definitely needed some work. 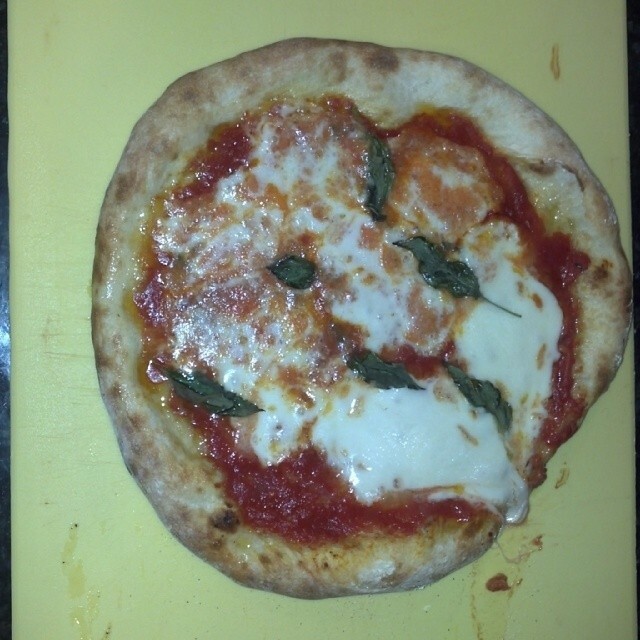 I started researching pizza dough and found a great starter recipe. That dough recipe proved to be more successful and much more delicious. 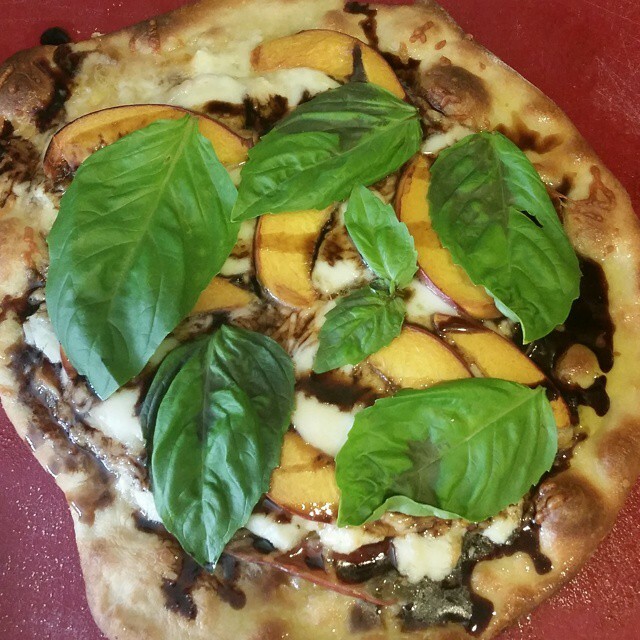 The more we make dough the more I realized fresh ingredients were very important. We kept experimenting and playing with combinations of ingredients and toppings to find what we loved best. 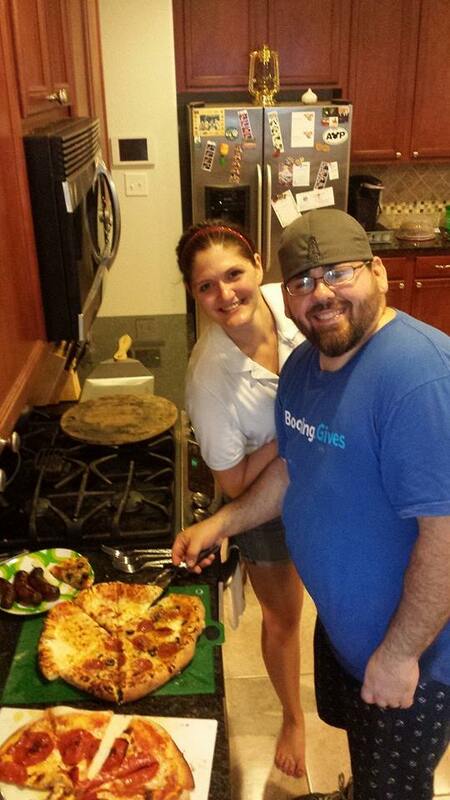 For Father’s day we stated a pizza making “competition” which is always really fun because no one makes pizza the same. 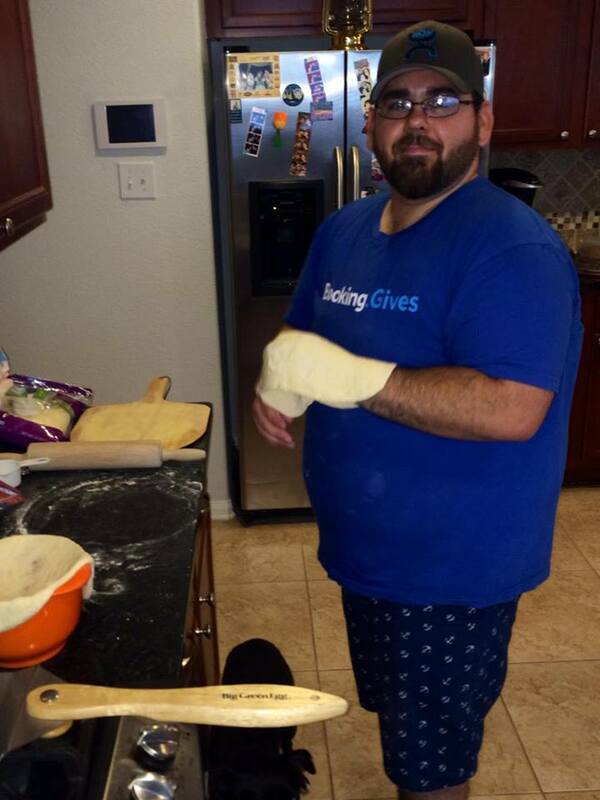 Big shout out to Joe because, yall, this man can hand toss some dough! I make the dough and sauce but he rolls it out and tosses it. I cant make a circle out of dough to save my life. We make a great team. 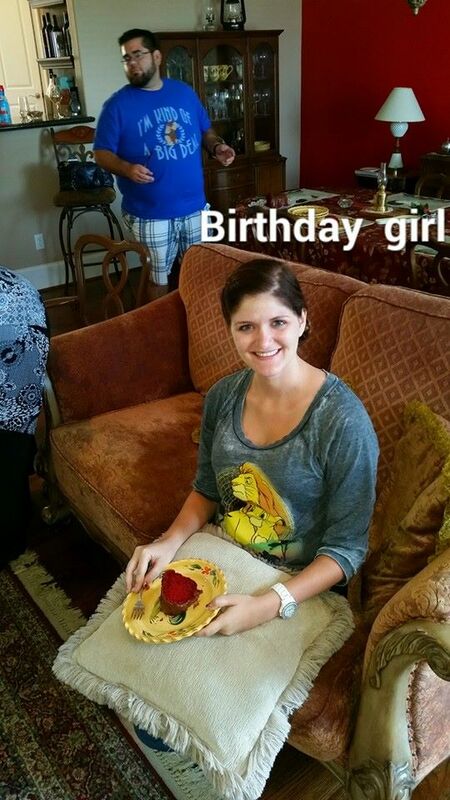 I also require Chicago Deep dish for my birthday…hint hint dad! 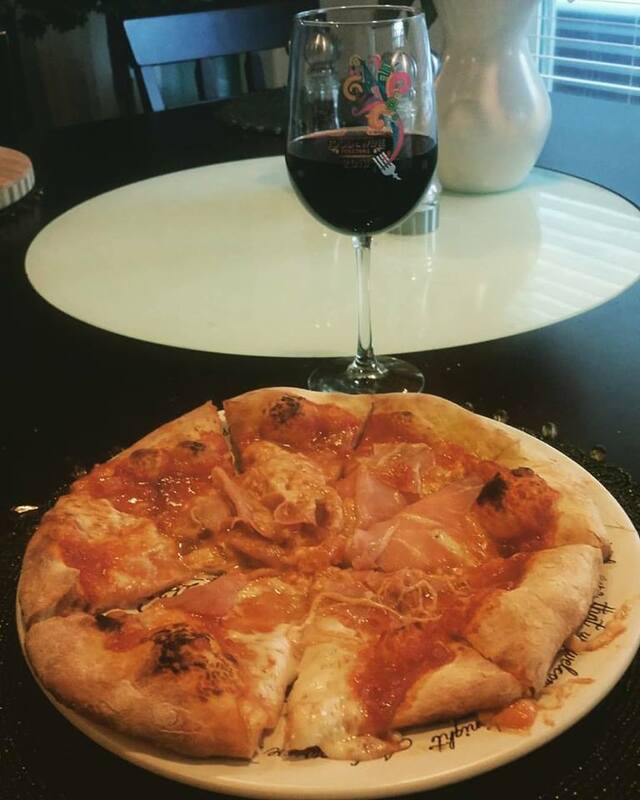 My pizza style is more authentic Italian style which is my favorite. My dad makes Chicago deep dish and thin crust. My mom and brother make New York style. Clearly we are a pizza diverse family and I love it. 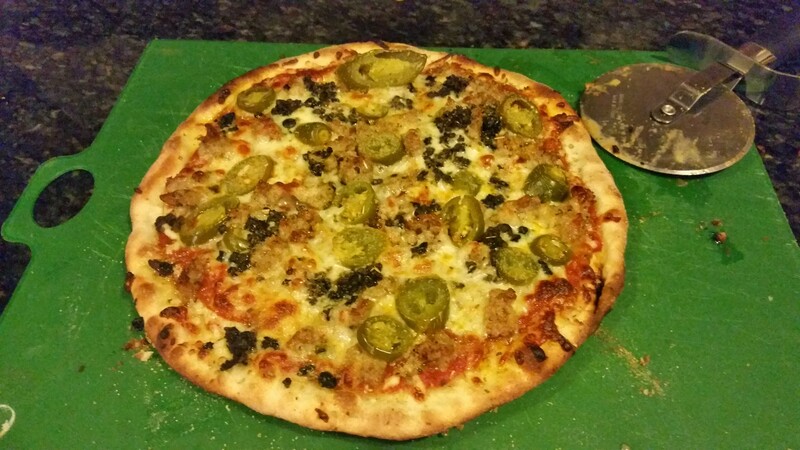 Today’s recipe is my dough and sauce recipe that I have been working on for a few years. As with all recipes, make it your own I know I sure did! For the sauce, confession, this is 100% my recipe. I made it by, honestly, looking at the side of the jar of Delallo Pizza sauce. This is THE BEST jar pizza sauce with only real ingredients. Of course you can use it instead of making sauce but the sauce only takes about 30 minutes and is super easy to put together. Anyway, I looked at the jar and guessed quantities of the fresh ingredients, combined them together to make my sauce. I tweaked it based on preference and now wont go back to anything else. Seriously yall, pizza snob. Combine flour, sugar, salt, and yeast in bowl of food processor**. What I do is 2 1/2 cups of flour then the yeast and sugar, add the rest of the flour then the salt and pizza dough flavor. This is because yeast and salt dont really get along and I find that the dough will rise better that way. Pulse 3 to 4 times until incorporated. Add olive oil and water. Run food processor until mixture forms ball that rides around the bowl above the blade, about 15 seconds. Continue processing 15 seconds longer. Transfer dough ball to lightly floured surface and knead once or twice by hand until smooth ball is formed, not too sticky. Divide dough into three even parts and place each in a covered quart-sized air tight container or in a bowl dusted with flour. 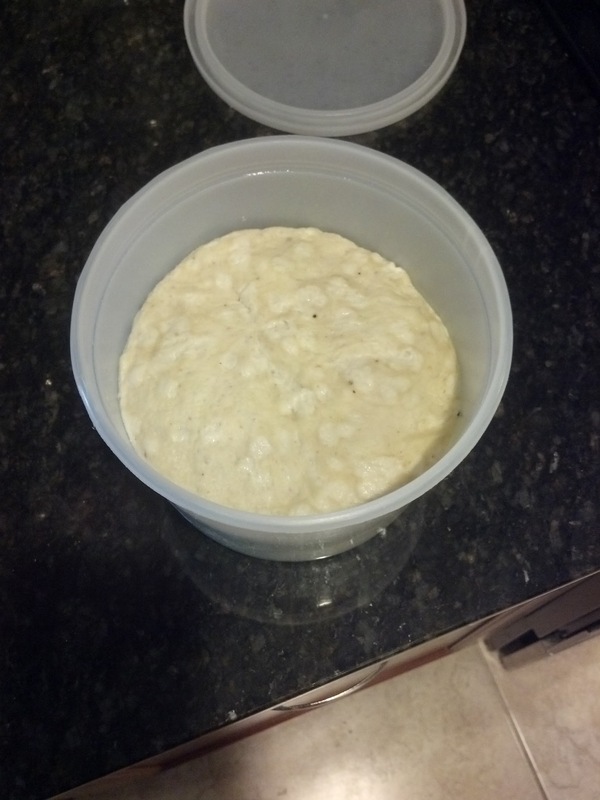 Dough that is in a covered container place in refrigerator to use tomorrow or another day (dough lasts about a week). Dough that is in a bowl dusted with flour cover with a towel and place in a dark dry place. I usually use my oven since its really humid in Houston, my dad used to use the attic. The pantry is a good place too. At least two hours before baking, remove dough from refrigerator and shape into balls by gathering dough towards bottom and pinching shut. Flour well and place each one in a separate medium mixing bowl. Cover bowl with a towel to rise at warm room temperature until roughly doubled in volume. Skip this step if using dough same day, let that dough rise at least 3 hours. 1 hour before baking, adjust oven rack with pizza stone to middle position and preheat oven to 550°F (if your oven doesnt get this hot set as high as your can go). Turn single dough ball (split in 2 if you want to make individual pizzas, one single dough ball will make a pretty large pizza) out onto lightly flour surface. 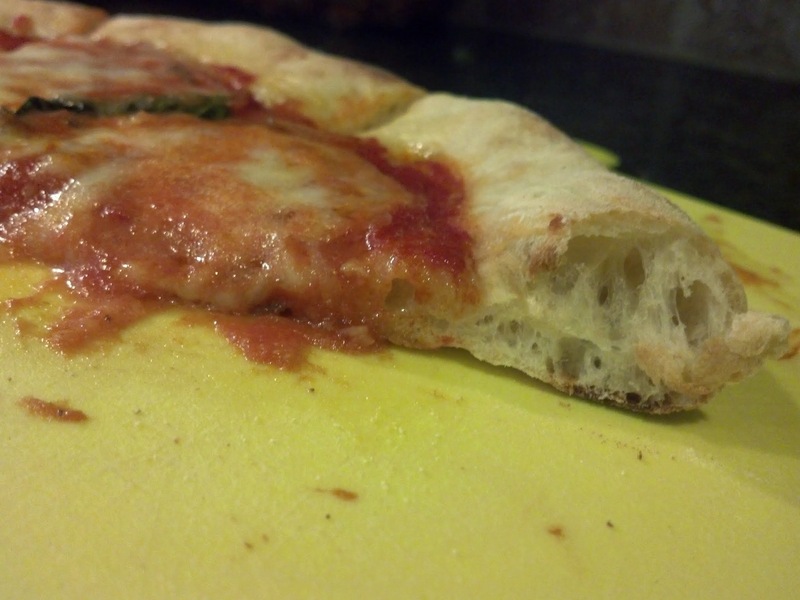 Gently press out dough into rough circle, leaving outer 1-inch higher than the rest. Gently stretch dough by draping over knuckles into a larger (dimensions depend on how much dough you choose to use)circle about 1/4-inch thick. Transfer to pizza peel. 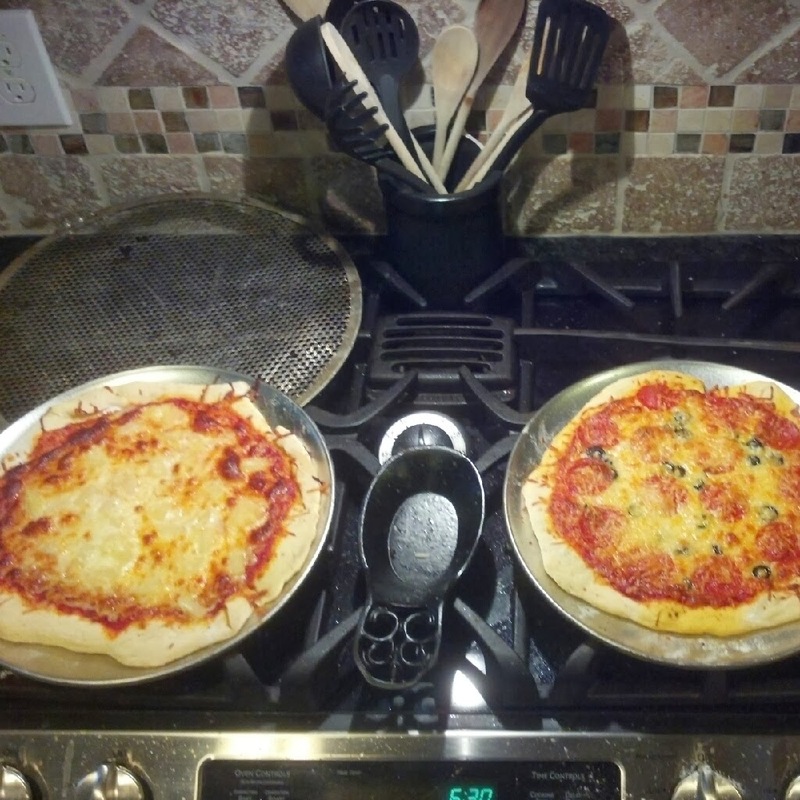 I use 2 pizza stone, one on the top rack and the other to put the pizza on. This simulates a pizza oven feel and gets the dough a better crisp. 5. Make your pizza! If you are able to get your oven to 550 cook time will be around 5-6 minutes. Keep an eye on it, once it starts to get golden brown you can take it out. *I use the King Arthur flour measuring method trust me it does make a difference. **If you dont have a food processor you can use a stand mixer or by hand but just know best results are by food processor. This is because when you use the food processor not a lot of air gets in which helps the dough rise better. When you use a stand mixer or by hand air gets mixed up with the dough and dont give as good rise results. You have been warned! Combine all ingredients in a pot over medium high heat. Bring to a boil then simmer for about 30 minutes. This is to enhance the flavors and bring it all together. You dont have to cook it but I think it helps the flavors. Can be stored for a week in the freezer or longer in the freezer. Feel free to experiment with toppings. I tend to stick with fresh mozzarella and prosciutto with basil (basil and prosciutto added after pizza has cooked). 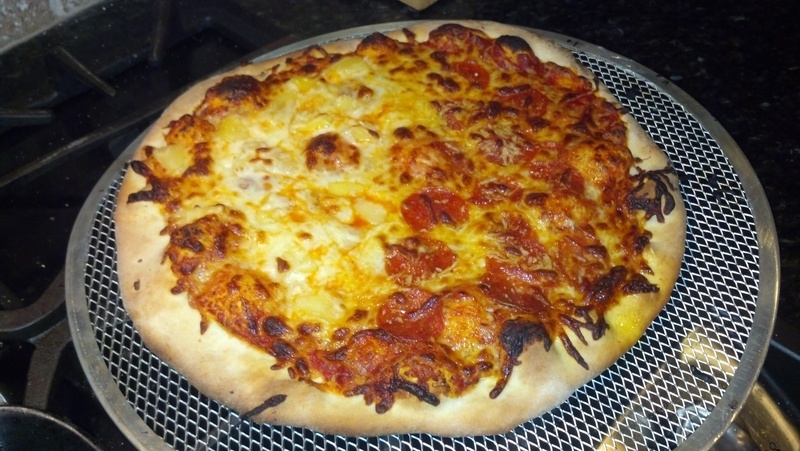 Joe never makes the same pizza twice but I will say fresh mozzarella makes the pizza. It tastes so much better than the stuff in the bag. Trust me you will thank me later. I love pizza, so throw me your pizza questions and I will do my best to answer. CHIME IN!!! Any food you are passionate about? What are you doing this weekend?